Dark chocolate brings a huge antioxidant boost to dishes, as well as an unorthodox flavor profile. In fact, dark chocolate is definitely not just for dessert. Looking for a way to up your creativity in the kitchen while you increase your antioxidant intake? 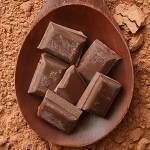 Check out these recipes for some new and interesting uses of dark chocolate! Roasting vegetables brings out their naturally sweet flavor, which pairs delightfully with cocoa and warm spices. This recipe calls for roasted squash, potatoes, carrots, onion, bell peppers, brussel sprouts, and tomatoes, but you can easily substitute your favorites, or whatever is in season in your area. The spice rub offers a subtle heat, deepened by unsweetened cocoa powder. 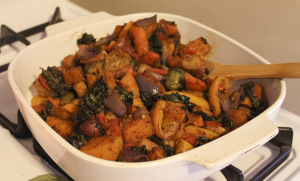 Check out the full recipe to start making your own cocoa-infused roasted veggies. Cocoa powder is a staple ingredient of the classic Mexican mole, a rich and earthy sauce that you can use to top just about anything (and believe us, you’ll want to use it to top everything). This recipe is a little process intensive, and requires some ingredients that may require a visit to a specialty store, but for the adventurous cook – or the lover of dark chocolate – it’s an absolute must. 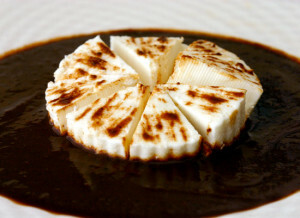 Check out the recipe for mole poblano here, and let us know how it comes out!